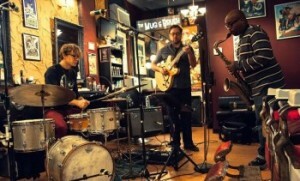 The monthly residency series at Dicks Den has provided many chances to see local musicians in rare lineups play various styles of jazz and other genres. Veteran guitarist Brett Burleson’s July residency starts on Wednesday the 9th, offering a new glimpse into the breadth of a great local jazz musician’s skills and interests. Brett was kind enough to give me a rundown of the different programs he has planned for each Wednesday. Each show will run from 9pm to 1am to give us working types a better chance to catch some weeknight tunes. Cover is $4. Wednesday, July 9th will showcase Burleson in a guitar trio with Doug Richeson on bass and “Daddy-O” Joe Ong on drums. Wednesday, July 16th will feature the Brett Burleson Band with Eddie Bayard on saxophone, Roger Hines on bass, and Ryan Jewell on drums. Wednesday, July 23rd brings another quartet with Paul Brown on guitar, Nate Smith on bass, and Maxwell Button on drums.